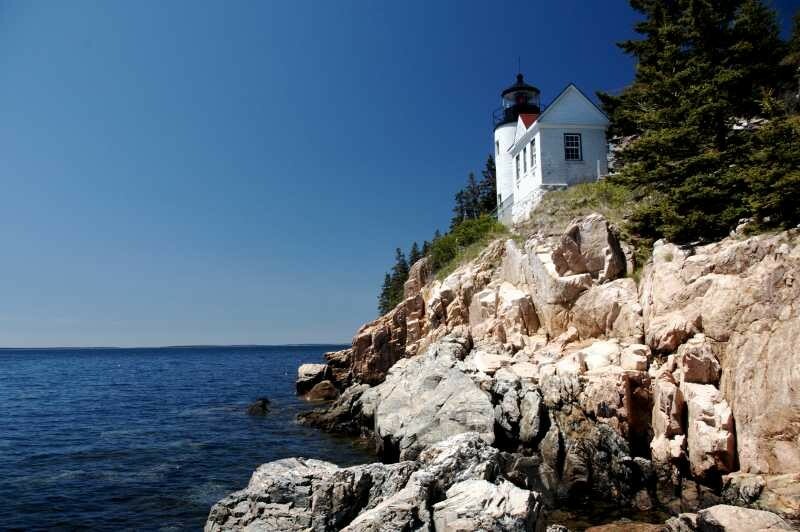 The first time we visited Maine, long before we became the owners and innkeepers at Brewster House B&B in Freeport Maine, we fell in love with Bass Harbor Head Lighthouse. We spent a few days of our trip on Mount Desert Island, in Bar Harbor, and visiting some of the really picturesque spots, from Acadia National Park to Southwest Harbor, Northeast Harbor, and Bass Harbor, but our favorite was Bass Harbor Head Lighthouse. Not too long ago we revisited our beloved lighthouse, and were reminded of the secret we had inadvertently discovered on our first visit, but more about that in a moment. To get to Bass Harbor, from elsewhere on Mount Desert Island, head for Southwest Harbor. At the intersection on Route 102 there is a sign indicating that Bass Harbor is to the right, but Route 102 makes a loop, so either way will actually work. If you’ve gone to the right, you’ll need to stay left where the turn for Tremont goes right, then take Lighthouse Road (which feels like a long driveway) out to the lighthouse location. Since our first visit we’ve been back many times, and have recommended it to many guests, and a number of friends. Sometimes we hear back that they just didn’t see what was so wonderful about the lighthouse, as the view wasn’t that good. When they say that, we know that they’ve forgotten the secret. The most recent time we were there, we pulled into the parking lot, where there is a large sign from the US Coast Guard, who maintains the light, directing visitors down the paved path to the right of the lighthouse (as you face the water), where you can see the lighthouse up close. However, up close doesn’t always make for the kind of photograph you are seeking. Sure enough, there was a man, loaded down with photographic equipment, trudging dejectedly up the hill to the parking lot. Spying our camera bag, he asked if we knew where to get a “good” picture of the lighthouse. We told him to come with us – and the secret was revealed! At the far end of the parking lot (near the restrooms) is an unmarked, dirt, path through the woods. At the end of the path is a wooden staircase, leading down to the rocks below, at the waters’ edge. From there you look up at the lighthouse as it perches on the cliff, and this is where the more dramatic photos can be taken. And that’s the secret of Bass Harbor Head Light.